Other Common Names: Anethum, dilla, anise, shubit, eneldo (Spanish), shih lo (Chinese), dild (Danish), aneth (French). Habitat: Dill is probably endemic to the southwestern parts of Asia, where the plant has been known since ancient times. Plant Description Dill is a plant belonging to the celery family (Apiaceae) that can grow up to 40–60 cm in height. It has slender stems and alternate and finely divided, softly delicate leaves around 10–20 cm long. Leaf divisions are 1–2 mm broad, slightly broader than the similar leaves of fennel, which are a thread like, but harder in texture. The flowers are white to yellow. The seeds are 4–5 mm long and 1 mm thick, and straight to slightly curved with a longitudinally ridged surface. 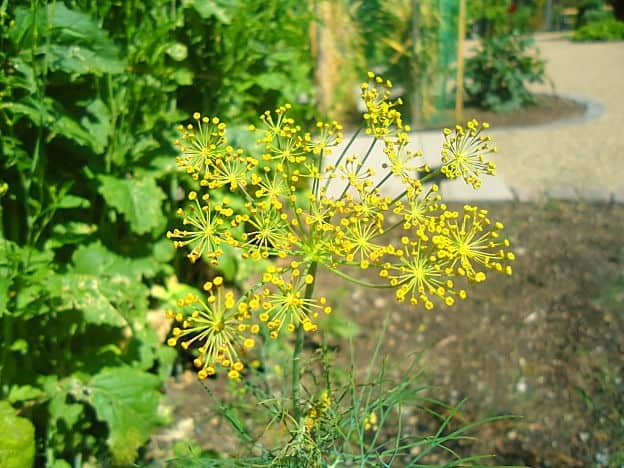 Dill is in leaf from May to November, in flower from April to July, and the seeds ripen from July to August. Plant Parts Used: Leaves, flowers, seeds. The leaves should be picked fresh, usually after the plant has reached 8.5 cm in height. The leaves are often difficult to dry successfully, and the dried leaves must be stored in closed containers in order to retain some of the flavors. The seeds should be collected when fully mature and then spread out and air dried. An essential oil can be extracted both from the fresh leaves and from [easyazon_link identifier=”B000N55YQW” locale=”US” tag=”herbal-resource-20″]the seeds[/easyazon_link], these two oils differ slightly in terms of scent and taste. 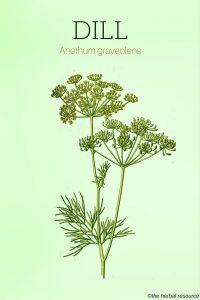 Dill has been used both as food and medicine for a very long time. The herb was already mentioned in The Ebers Papyrus, an Egyptian papyrus of herbal medicine knowledge dating to c. 1550 BC, where it was described as a remedy for anti-flatulence, dyspepsia, and constipation. The ancient Egyptians also used it in the production of cosmetics and perfumes. In Ancient Rome, dill was a well known and widely used herb. The Roman gladiators rubbed the dill oil into their skin and they used the burned seeds on wounds to speed up healing. 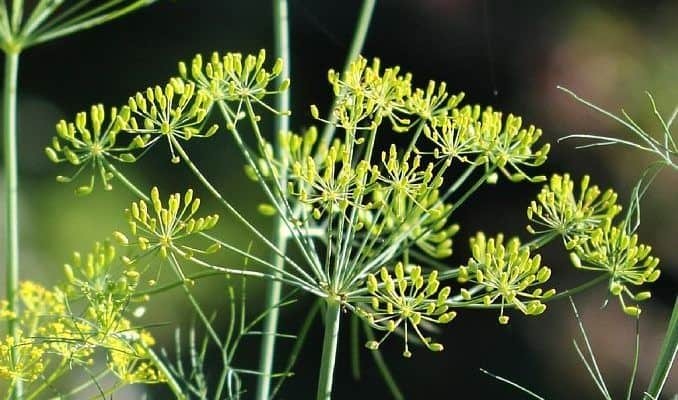 From the Roman Empire, the herb was spread to North Europe by monks and the first European settlers brought the dill plant with them to North America. Dill is used as an appetizer. It is believed to stimulate peristaltic motion of the intestine and it has been used as an herbal remedy for heartburn. It is used as an herbal remedy for insomnia. The flavonoids and vitamin-B complex which dill is rich of are believed to activate the secretion of certain enzymes and hormones which have a calming effect. Monoterpenes and flavonoids present in its essential oils are germicidal or bactericidal in nature. They can help treat diarrhea by inhibiting microbial infections. Dill is high in calcium which promotes healthy teeth and bones. Also, dill seeds and leaves are very good mouth fresheners due to its anti-microbial nature. It may help to protect the stomach lining. It has shown significant reduction of stomach acid secretions in mice, but has not yet been tested on humans for this effect. Substances known as polyacetylenes found in the herb have been shown to have antibacterial and antifungal activity as well as anti-inflammatory effects. Additionally, the herb contains dietary fiber and it is a good source of the minerals manganese, iron and magnesium. It has been thought to help lactating women increase the flow of milk. For menstrual disorders, the flavonoids in the essential oils of dill are believed to stimulate secretion of certain hormones which in turn help maintain proper menstrual cycles. The herb is commonly added to a cough, cold and flu remedies and it is speculated that it may be useful as a treatment for some types of asthma. An extract made from the seed has been used in the treatment of acid reflux, peptic ulcer, urinary tract infection, and headaches. Externally, extracts of the seeds were used to treat head lice and hemorrhoids. Furthermore, the essential oil is said to be a good remedy for an earache. Since dill is so widely used and recognized as a spice or flavoring agent, it is best to use it as that. Dill is a unique plant in that both its leaves and seeds are used as a seasoning. The green leaves are wispy and fernlike and have a soft, sweet taste. Dried dill seeds are light brown in color and oval in shape. The seeds are similar in taste to caraway, with a flavor that is aromatic, sweet and citrusy, and slightly bitter. Leaves are best used fresh, while the seeds are most commonly used dried. 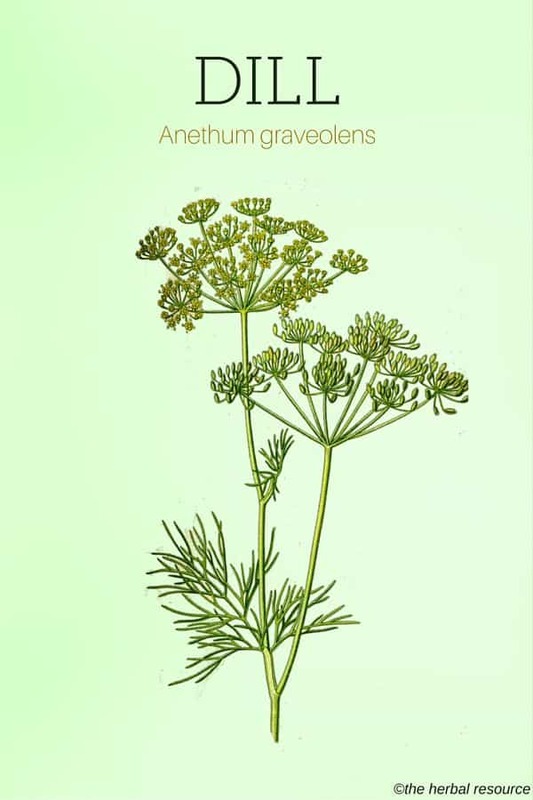 The flowers of the dill plant are also sometimes used to flavor soups and salads. It is also common to chew on the dried seeds as a breath freshener. Reports on the side effects of dill are limited. The most common side effect is dermatitis but it is considered very rare and usually only when dealing with large quantities of the live plant outdoors in the presence of ultra-violet light. Mars, Brigitte: The Desktop Guide to Herbal Medicine. Laguna Beach. Basic Healh Publications, Inc. 2007.
van Wyk, Ben-Erik & Michael Wink: Medicinal Plants of the World. Portland, Oregon, Timber Press. 2004. Williamson, Elisabeth M.: Potter’s Herbal Cyclopedia. Essex, Saffron Walden. 2003.